Apple has issued a supplemental update to macOS High Sierra 10.13.6 that addresses the throttling issues exhibited by the 2018 MacBook Pro. Those who have installed the update report that they are seeing improved performance in the Core i9 model and that the CPU is now at least able to sustain the base clocks. 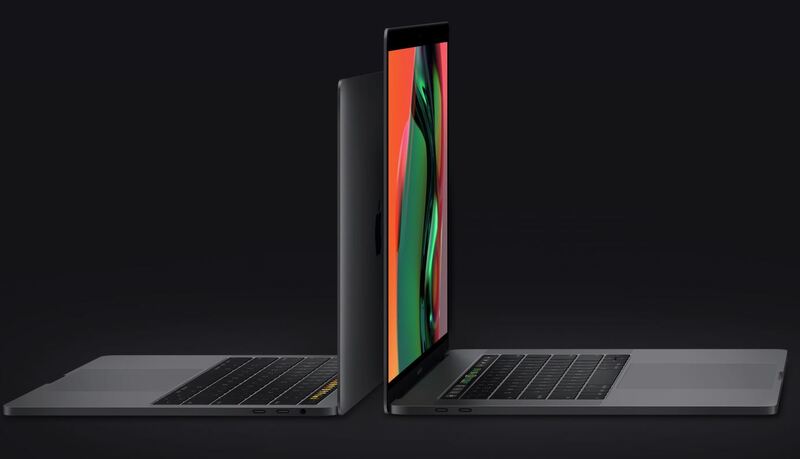 Apple's poor implementation of thermal management in the 2018 MacBook Pro has come under much criticism with the high end Core i9 models not even being able to reach their base clock speed under stress due to excessive heat. In a response to YouTuber Dave Lee's (Dave2D) video, Apple said that a supplemental update is being issued immediately to remedy this problem. Following extensive performance testing under numerous workloads, we’ve identified that there is a missing digital key in the firmware that impacts the thermal management system and could drive clock speeds down under heavy thermal loads on the new MacBook Pro. A bug fix is included in today’s macOS High Sierra 10.13.6 Supplemental Update and is recommended. We apologize to any customer who has experienced less than optimal performance on their new systems. Customers can expect the new 15-inch MacBook Pro to be up to 70% faster, and the 13-inch MacBook Pro with Touch Bar to be up to 2X faster, as shown in the performance results on our website." Apple has not shared any information on what this 'missing digital key' is all about but those who have installed the said update seem to have noticed a significant performance bump in the Core i9 model. CNET's tests showed a much more stable clock speed and temperature. 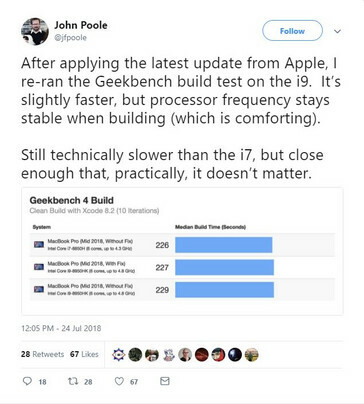 Geekbench Labs founder John Poole ran a Geekbench 4 Build on XCode and found that the patch enables the Core i9 to at least show Core i7 level performance. Poole said that Core i9 models offer better performance for single-threaded applications while multi-threaded applications will see similar performance between the Core i7 and Core i9 models. Dave Lee, who first reported the throttling issue, said that he's satisfied with the performance after applying the patch but the Core i9 could have performed even better if given sufficient headroom. In our own tests, we found the patch positively impacted the MacBook Pro 13's performance but the 15-inch MacBook Pro did throttle down after a few runs of Cinebench indicating that we've reached the limits of the cooling solution. Dave said he had enquired whether this patch was related to the VRM power throttling that was reported on Reddit but Apple said that it is not the case. So, theoretically, if Apple still doesn't address the VRM power limit, the effective utilization of the full performance of the Core i9 might still be hindered.